As (No) Malice once announced, “The boy’s such an author, I should smoke a pipe.” We consider ourselves equally literary and you can go hard with the book references when it comes to making shoe colourways — some of the Grove Press covers from the 1960s are perfect inspiration and we’d like to see some Burroughs and Joyce prose made physical on a shoe upper. 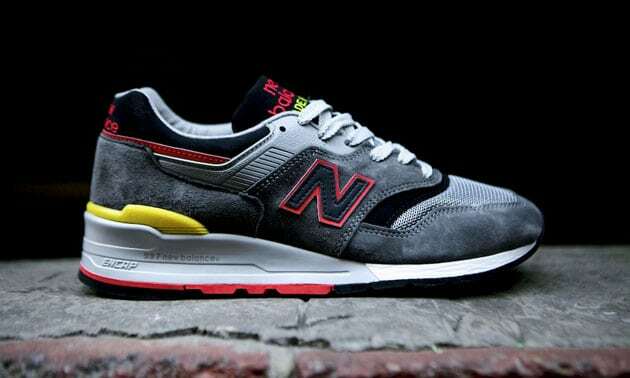 These New Balance 997s are playing on their American classic status by using colours from a real American classic — the first edition of JD Salinger’s ‘The Catcher in the Rye’ with its red and yellow accents. The sock liner even homages the cover’s typography. Holden (were he real) would definitely scowl at these and Salinger would probably be too reclusive (were he alive) to pass judgement on them. We think this colourway’s pretty strong. New Balance seems like a pretty intellectual brand — we’re not up on authors and their preferred shoe brands but in directorial terms we know Wes Anderson is a fan. But then again, Stanley Kubrick used to wear Nike Air Mad Max and David Fincher rocked Jordan Vs. That always boggled our minds — as did JD Salinger’s son Matt playing Captain America in that terrible 1990 comic book adaptation. Anyway, apologies for the digression — we’ve said everything about this silhouette before: 1990…very expensive…perfect shape…blah, blah, blah. These should be online tomorrow.